This is a wrist watch. Only it’s not a watch at all. It’s a compass and sundial that you wear on your wrist. Point due north and you’ll have perfect directions and approximates on the time, all shared with you by the power of the sun and earth’s gravitational pull. Yay! Science! This product is best suited to people who don’t have to be anywhere on any strict schedule. Prehaps you’re some sort of ship captian in search of large sea mammal. If you’re supposed to be meeting your boss however, probably best to stick to more modern time and direction tools. If you’re a gentleman adventurer, then this is the wristwatch for you but if you work in an office, you should probably pass. If nothing else, it will be a conversation piece. 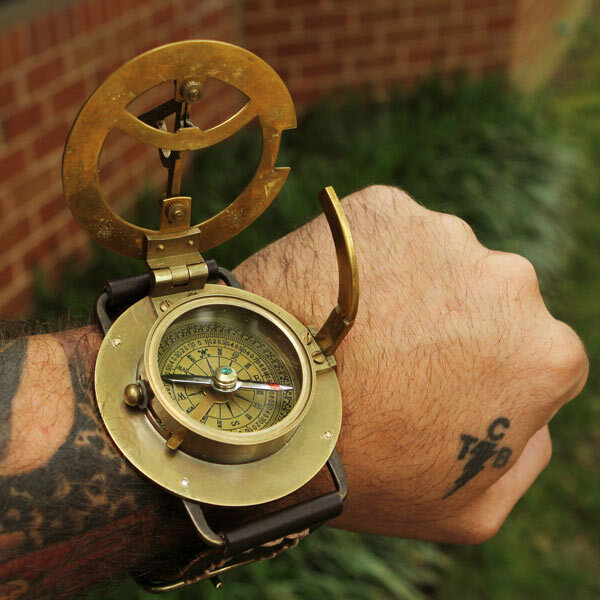 The Navitron Steampunk Wrist Compass and Sundial is $39.99.